James Repp, of Adel, passed away at home on Monday, February 4, 2019. Funeral services will be 11:00 a.m. Tuesday, February 12, 2019 at the United Methodist Church in Adel with burial at the Iowa Veterans Cemetery near Van Meter. Family will greet friends Monday, February 11th from 5:00 to 7:00 p.m. at Caldwell Parrish Funeral Home – McCalley Chapel in Adel. James was born May 12, 1962 in Guthrie Center to Clinton Repp and Lyndy (Wine) Sheehy. He graduated from high school in 1981, and then enlisted in the U.S. Army. After serving in the Army, he then worked at Firestone for 30 plus years. 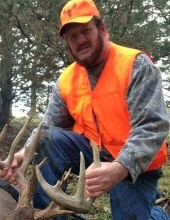 James enjoyed bicycle riding, farming and working with his cattle, hiking with his kids, family ancestry, and shotgun hunting in Guthrie County with friends. James is survived by his wife, Yvonne; children, Clinton Repp, Raychelle Repp, Heather Hudson and Courtney Pierce; 5 grandchildren; step children, Jacquelynn Serrano, Corderro Serrano, Gabrielle Kent and Alex Kent; mother Lyndy Sheehy; siblings, John, Tammy, and Judy. He was preceded in death by his father Clinton; daughter, Cassondra Repp; and his grandparents. To send flowers or a remembrance gift to the family of James Lee Repp, please visit our Tribute Store. "Email Address" would like to share the life celebration of James Lee Repp. Click on the "link" to go to share a favorite memory or leave a condolence message for the family.